Almost 2 years ago, I posted how to deploy a custom Safari Toolbar. But until now I have not posted on how to make the Toolbar (READ: Extension Bar) until now. The reason for the delay was due to me not really being literate with the technology used to create an Extension Bar, 2 years on & i’m still not! We use the Extension Bar to deploy links to company websites & resources. As it seems most web based products we have only support Safari on a Mac, we’ve found this is a good way to drive people to use Safari to access these sites, even if they use other browsers for general browsing. I hope the below helps you to create your own. Download the macmule Toolbar example. As mentioned I am not particularly literate with the technologies used, so I’m going to explain in a luddite-esque manner which bit relates to what. The “toolbar_icon.png” is the icon within the Toolbar button, this image needs to be of limited dimensions & in the example is a png with dimensions of 64 x 64. But as Extension bars are essentially websites, you’ll need to copy the image to use within the examples .safariextension folder, then you can select a new image from the “Image” drop down. If you press the Toolbar button, it should toggle showing/hiding the example Extension Bar. I really like this (as do the people that have this on their macs) as it can free up screen estate when needed. The Extension bar itself is just a 30px high web site, as such we have a html file which in the example is called “extension_bar.html” & is shown below. 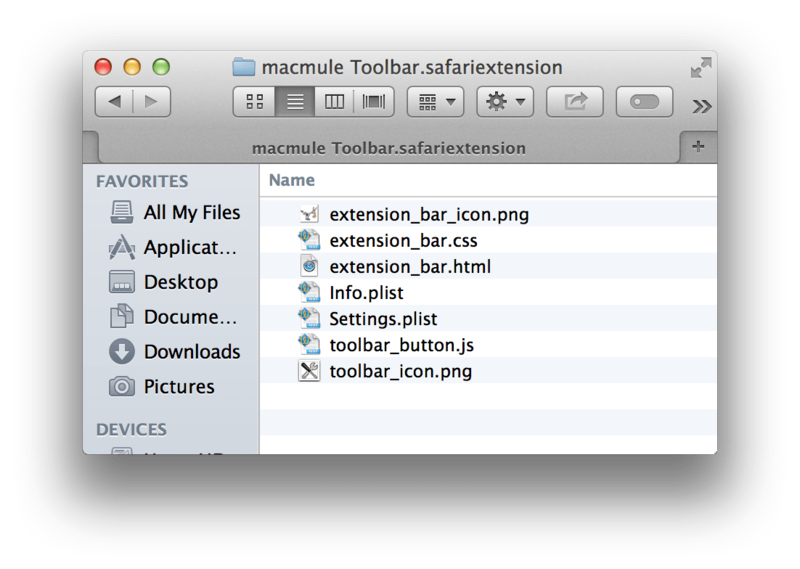 The macmule icon is called “extension_bar_icon.png” & can also be found in the examples folder. The 30px height is very important, I’ve spent too much time trying to create a drop down menu like the standard Safari Bookmark folders, only to find that the drop down has been constrained by the 30px with no way of overriding it. This html file is specified within Extension Builder under the “Extension Global Page” section, if you place another html file within the .safariextension folder you can select it from the drop down. With the Extension Bar being a website, we can then style it using CSS. In the example this is called “extension_bar.css” & is shown below. This CSS file is reference by the html file as normal as well as being defined within Extension Builder. Again as with the other files, if you place another CSS file within the .safariextension folder you can select it from the drop down. The below is our current toolbar, just being shown to give an example of what you can when editing the CSS & html files alone. I make the needed changes within TextWrangler to the html & css files directly, then make any changes within Extension Builder (for Tooltips, css files to use etc). But work in whatever way suits you best. Then within Extension Builder click “Reload,” this affectively refreshes the Extension Bar with the changes made. Once you are happy with your Extension Bar, click “Build Package.” This will create a complied version of the Extension Bar, then you’ll need to deploy it to your Macs using your favourite packaging too to the ~/Library/Safari/Extensions/ folder for any account you’d like to deploy to. I use Composer, & create a DMG. Once uploaded to Casper we deploy using FEU & FUT’s. But this only copies the files into the correct place, into order to install the Extension Bar run the script here. For more information, please see the Apple Safari Extensions Development Guide.